The personal injury attorneys at the Sinas Dramis Law Firm are uniquely poised to handle brain injury cases; after all, we have been doing so for decades. In Michigan, over 10,000 individuals suffer some sort of trauma to the brain every year due to an auto accident or other causes. Thirty (30) percent of those are brain injuries or other brain trauma as a result of an auto accident. Medical and technological advances have helped improve the way of life of brain injury accident survivors, which means that individuals are now living with their injuries longer than they would have in the past. While this is a testament to how far we have progressed, this also presents unique challenges that become apparent when litigating cases where trauma to the brain has been sustained. Over the years, our attorneys who handle brain injury cases have helped numerous individuals in Michigan seeking to recover from their brain injuries. Through effective legal advocacy, our law firm has fought – and will continue to fight – for our clients’ right to access the medical care and benefits they need. Throughout our decades of experience, we have come to understand that individuals suffering from these injuries may be in for a difficult journey. Let us help you fight some of your battles so you can place more focus on your recovery. Let us help you gain access to the benefits and compensation you deserve so you can move on. As part of our personal injury practice, our lawyers handle traumatic brain injury cases all over Michigan. Advocating for survivors of traumatic brain injury is an honor we take very seriously. We have worked hard for over 60 years to advance the rights of traumatic brain injury victims throughout the state. At the Sinas Dramis Law Firm, we believe wholeheartedly in “helping people know the law,” a mission that dates back to the founding of our law firm in 1951. We do this through our representation of thousands of people throughout Michigan. While providing high-quality legal representation, we strive to educate our clients about the law governing their case, such as the Michigan auto no-fault law (if you were injured in an auto accident). Michigan attorney, George Sinas, serves on the Board of Directors of the Brain Injury Association of Michigan (BIAMI), an organization that has done so much to advocate and protect the rights of brain injury victims, their caregivers, and their families. In addition, a number of our attorneys have attended conferences and participated in seminars about the legal aspects of caring for brain injury survivors, especially in the auto no-fault context. We understand that those who have sustained this type of injury have a long road ahead of them, which is why they deserve to have access to the benefits they deserve under Michigan no-fault law. As part of his commitment to brain injury victims across the state, George Sinas also serves as General Counsel to the Coalition Protecting Auto No-Fault (CPAN), an organization which advocates for the protection and preservation of the Michigan no-fault system and the generous benefits, allowing those who have suffered trauma to the brain due to auto accidents to get high-quality treatment they might not otherwise have access to as a result of our current system. In addition to protecting brain injury victims by helping them with their legal claims against insurance companies and those at-fault for causing their injury and suffering, our law office is also committed to preventing brain injury accidents, especially with children. Partnering with a number of local and state-wide organizations, including Origami Brain Injury Rehabilitation Center and the BIAMI, our law firm started Lids for Kids in Lansing, Grand Rapids, and Traverse City. These programs aim to provide school-aged children with bicycle helmets as well as teach them the importance of riding safely. Many of the children who benefit from this event might not otherwise be able to afford bicycle helmets, and riding without a helmet is just too risky of an endeavor. 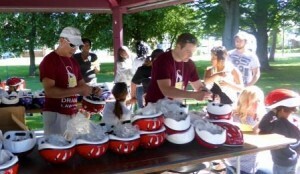 We have given away over 4000 bicycle helmets to children in the Lansing, and Grand Rapids area, and will continue the condition for years to come. Why? Quite simply, our view is that if we can prevent even one brain injury from happening to a child, it’s well worth it. Concussions in children are more common than we would like to admit. In addition to riding their bicycles, children are involved in a myriad of activities, especially sports, where suffering a concussion or other type of head injury may not be out of the ordinary. In fact, in 2009, close to 250,000 children in the United States were treated for a sports-related traumatic brain injury (TBI) accident or concussion. Fall-related TBIs are also common in younger children. We hope you will find these pages to be helpful resources, answering your questions and concerns about brain injuries and their potential aftermath. As always, should you have any additional questions or concerns, or wish to discuss a potential legal claim, do not hesitate to contact our Lansing or Grand Rapids law offices for a free initial consultation.